Best day: January 20, 1.802 visitors. Bogdan Stancu signs from Galatasaray and a comparison between Lacina Traore and Bogdan Stancu, written in November 2010, before their moves to Russia and Turkey, respectively, gets a lot of attention especially from Gala’s fans. The surprise came when Traore moved to Kuban Krasnodar for less money than what CFR Cluj was hoping to get, while Stancu’s deal demanded a fee that can be explained only by the Becali’s involvement and their understanding with both Steaua’s and Gala’s boards. And, while Traore is a hit under Petrescu’s strict command, Stancu failed to cope with the pressure and the controlled chaos that Galatasaray seems to enjoy living in every single year, and is now playing with some success on loan to Orduspor. Search terms: “scouting Romania” and my name occupy the first two places, with Marius Niculae in third spot. The top five is closed by “Wesley Vaslui” and a certain Cristiano Ronaldo. Don’t worry, the only thing to blame is a photo of the guy taken while Niculae was playing alongside him for Sporting Lisbon. The all time leader remains Gabriel Torje! Most clicks: The Scouting Network, one of the companies I used to work for, followed by my Twitter feed, where I’m very, very close to 3.000 followers. Best referrers: The Almost 3.000 are the ones that get credit, with Twitter sitting comfortably in 1st place. The Guardian helped to finish the year in style, the blog’s presence in “Our favorite things this week” column brining in a lot of (quality) traffic. 3. Otelul Galati, before their Champions League debut disaster. After Chiriches and Chipciu, who have already joined the club, Steaua has reached an agreement with FC Vaslui for Wesley’s transfer, but the Brazilian ace is not in a hurry to leave his current club, although the owner, Adrian Porumboiu, is sending some disturbing messages. In a period expected for almost a year, when the transfer ban should finally be lifted, instead of a spending spree, Porumboiu keeps underlining his decision to retire next summer, looking eager to offload the highest earners and the best players, in order to reduce the costs to a minimum until the moment when he’ll be passing on the club to the local authorities. Wesley has two more years on his current deal – impressive by our standards – and is waiting for Gigi Becali to at least match the wages in order to complete what could be the hit of the winter mercato in Romania. With the all time best foreign scorer in Liga I ineligible for the Europa League matches, it’s obvious that Steaua will try to push for the title in 2012, and the red and blue outfit is getting some positive signals from league leaders, Dinamo, who are having a hard time keeping Marius Niculae from nailing a last big contract abroad. In fact, the Top 3 teams (Dinamo, CFR Cluj and Rapid) are yet to make a move, with Universitatea Cluj, currently in 7th place, getting two important additions already. Goalkeeper Mircea Bornescu – impressive in the handful of matches played for Petrolul, after his failed attempt to play in the Greek SuperLeague – and central defender George Galamaz – who left Steaua on a free transfer – will add experience and further strengthen a team that was looking good on paper anyway before the start of the season, but failed to impress in the league, staying quite far from the European places. In the rumors section, we have Dinamo looking to sign Paul Parvulescu from Gaz Metan (they’ve been trying to do it for two years now…), but also Radu Barbu, a former U21 national team player who was released on a free transfer by… Petrolul, due to his below par performances. A name everyone uses when it comes to big clubs in need of a good striker is Costin Curelea, captain of Sportul Studentesc, who scored 3 goals for the team placed third from bottom. Steaua seems to have some problems selling Iasmin Latovlevici for around 1 million Euros, heavily linked with Saint-Etienne by the Romanian media for a couple of weeks, and are yet to make a move regarding the Costea brothers, who are unsettled and unsettling for the dressing room. I expect Rapid to offload a few players, with Cassio Vargas, Iulian Apostol and Glauber Berti among the favorites, but they definitely need at least one good front man. There are some similar signals coming from Otelul Galati, with the president Marius Stan saying that they could have Unirea Urziceni’s faith. Obviously, that’s too much and it means that the club is preparing the fans for some important sales. Transfer window wide open for Steaua. Two done, more to follow! Steaua parted ways with George Galamaz, the centre-back who moved on a free transfer to Universitatea Cluj as soon as the competition stopped, but the former champion with Unirea Urziceni makes way to one of the most promising central defenders in the country. With appearances for the likes of International Pitesti and Pandurii, Chiriches managed to play a solid game against France. Vlad Chiriches had signed with the red and blue outfit for a few months and the fresh Romanian international has now completed his move from Pandurii Targu Jiu. He teams-up with a certain Florin Gardos, a player who was basically at the same level a few months ago, but will hope for better fortunes, as Gardos has failed to regain his place in the team, after an impressive debut season. Wtith over 2 million Euros paid for 2 players, one in an area that was very well covered, Steaua needs some more money to make the team competitive. There’s a desperate need for a reliable right back, with Ifeanyi Emeghara unrealiable, Novak Martinovic not gifted for the role and Gabriel Matei out injured for a long period. There’s nobody in the centre of the park able to either play box-to-box or show at least some playmaking ability. Pablo Brandan, who’s just a versatile left back is now in the position to pull the strings in the middle, with Alexandru Bourceanu very hard working, but limited on the ball. In spite of all this, Gigi Becali is now very close to adding a new forward to a team that definitely doesn’t lack options upfront. But, if he indeed gets FC Vaslui’s Wesley, one of the best players in the league, it’s worth the extra investment. This is the sort of buy that can provide an instant return in terms of result, exactly what Steaua needs in order to have a chance to make up for the 8 points gap currently separating them from the Liga I leaders, their arch-rivals, Dinamo. Munteanu deserves it not just because there’s nobody else with something to show at the end of the year, but because he managed to take the best out of a mediocre team, to create the perfect tactics for the given group of players, to make everyone believe that winning the league is possible in Romania even if your only or, better said, main ability is to work harder than everyone else. 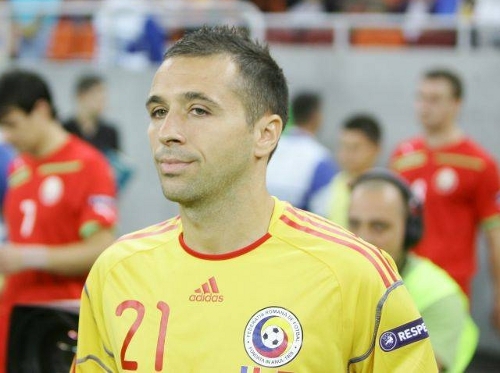 Lately, I get the feeling that Romanian players are ready to move abroad only in their 30’s. Buying them with millions, hoping to make a profit, is a costly mistake, because those who indeed have the talent and the skill need around 10 years to get their heads straight and understand what’s this all about. That it’s a job. And it needs dedication. Plus a lot of work. Sanmartean is just an example. Not the best, because the attacking midfielder has had a lot of medical problems in the past and, without them, he could have made it while in Holland or Greece. He’s delivering now and the outstanding skill on the ball has made even Claudio Lotito ask around for his age, after Vaslui’s encounters with Lazio, in the Europa League. He’s too old, as the man was quickly informed, but that’s good news for Adrian Porumboiu, who was able to renew and extend the player’s contract, a proof that Vaslui will continue to aim high for at least two more years. Of course, if Sanmartean will stay fit :). It wasn’t. Cerniauskas, the goalkeeper, had to leave the field injured in the first half. The outstanding Sanmartean resisted just until after the break, in a game Hizo had in the stands three regular starters suspended: Temwanjera, Papp and Wesley. It was simply too much for a team that has a transfer ban for almost a year and a small and very unfortunate squad. They’ve lost 2-0, but I think everyone should be proud of the club’s first ever European presence and hopefully the sometimes impulsive owner, Adrian Porumboiu, will have a good look at the big picture. It definitely doesn’t make you turns your eyes away! Surprisingly, Steaua did a lot better, in spite of a more delicate position, as the Bucharest side was also depending on a good result managed by the already qualified Schalke in Israel, not just on the win against AEK Larnaca. In front of 50.000 fans, who are starting to forget that their boycott was provoked by a club owner who’s still there and getting behind the team once again. The fans’ defeat meant the team’s victory though and it was a vital one, as the Germans played their part, inspired by Ciprian Marica who scored his first goal of the season for Schalke! After a nervous first half, Rusescu kept his cool and converted a penalty, but AEK struck back and things were looking bad for Steaua. Pablo Brandan’s quality and experience kept the team balanced though and Ilie Stan got all his subs right, although at least one of them came a bit late. A corner and a perfect counter were converted by Stefan Nikolic, the 22 years old striker loaned from Poli Timisoara netting a brace and sending Steaua in the European spring for the 9th time in the club’s history. Steaua was lucky in tonight’s derby, because if Rusescu wouldn’t have invented a long range shot to cancel Marius Niculae’s 13th goal of the season (last January, with 13 goals in half of seson, Bogdan Stancu was moving to Galatasaray for 6 mil. E!) Ilie Stan’s men would have struggled to get back into the game. They usually have trouble scoring and Dinamo was surprisingly solid at the back this year, mainly due to the good form of Cosmin Moti, who was once an AS Roma target, and the addition of Srdjan Luchin at right back. But at 1-1, with Pablo Brandan and Alexandru “Gattuso” Bourceanu pressing hard in central midfield, Steaua managed to increase the distance between Dinamo’s line, leaving Danciulescu and Niculae isolated upfront. Liviu Ciobotariu wasn’t inspired either, taking off Marius Alexe at half time and adding a striker on the left side proving suicidal for that flank, while Ilie Stan was going to be rewarded for understanding that Steaua needed a win, not a draw, and keeping an offensive setup until the very end. Two foreign, well-paid centre forwards, Mike Temwanjera and Yero Bello, the once promising Razvan Neagu in stand-by, all supported by the best offensive trio in Liga I: Lucian Sanmartean-Wesley-Adailton. This was Vaslui’s impressive striking force expected to help the club respect what’s become a tradition: achieve a better place than in the previous season, with only two options left this term: 1st or 2nd place. Ionut Balaur (right), celebrating alongside the Brazilian pair Wesley - Adailton. With 0 matches and, obviously, 0 goals in the top flight, Ionut Balaur, already 21 before the start of the current campaign, had the same chances to play and score. A paradox: lacking the numbers, he was there just for the numbers, yet the first occasion to make his debut at this level came sooner than everyone expected. He was going to play with the back at the goal, but not as the centre-forward he thought he was, but trying to cover for the numerous absences from central defense. The former Sporting and Juventus Brazilian, Gladstone, Paul Papp, the young international, Gabriel Canu – the skipper, all suffered long term injuries and the old dog Viorel Hizo was in a very difficult position, with games in the Europa League group stage waiting to give him nightmares in midweek as a bonus for the weekend head-aches. Hizo refused to look for a Mascherano though, was lacking a regular left-back anyway and couldn’t pick someone from the flanks, so he took a chance on the inexperienced big guy that was dreaming to score for Vaslui, not keep others like him from scoring.